Watermain Solutions South East Ltd have been working within the water industry for over 15 years, specialising in underground water mains renewals and repairs. We cover areas within Kent, London and all surrounding areas. We are fully qualified for the safe excavation, repair or replacement of your water main and reinstatement of works on completion. We have the latest tools and equipment on utility avoidance and trenchless technology (moleing) for minimal ground disruption . All work and materials are guaranteed for peace of mind. If you would like to get more information about the services we provide or just get experienced and reliable advice, please do not hesitate to contact us. We provide lots of plumbing services and always complete jobs to highest standards. 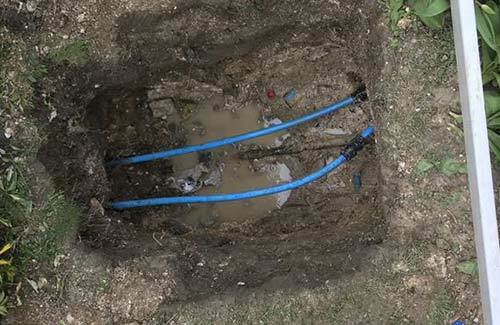 Watermain Solutions offers a full range of water supply pipe repairs using the latest technology and wherever possible we do not excavate to repair. Contact us for an initial visit and quotation after we have given you the best possible solution. We install new water mains for various companies, new build developers and water companies. Our staff are very experienced in this area and provide the best possible solutions to your exact requirements, we work to schedule and professionally. Water leaks are expensive, we use the latest technology to find your leak and repair it quickly and efficiently. You will receive a report of where the leak is and how best to deal with it. Contact us today, we can often be with you within 24 hours or if it is an emergency much sooner.